I’m a victim of this type of bully at my work place and I’m in my 40’s! I’m doing the right thing and reporting it. It’s going to be hard, but I’m doing it for me and for all the others that are bullied and can’t fight back. My thoughts are with you Cindy. I’m sorry you have experienced this. It’s the worst form of bullying because it isn’t aggressive. But it’s just as damaging to the emotions of the individual. Big hugs! I experienced this type of bullying from inside a women’s group. It was devastating because the person who exhibited the behaviors was incredibly sly. She holds a ton of victim energy and pulls people ( including me) in through her ‘poor me, I’m so creative but I’m still broke and I can’t catch a break’ stories. Our daughters were best friends and she leaned on me for strength and was actually holding my hand as she strained to push out her second child. Her amniotic fluid spilled all over my knees. She began by withdrawing, not returning phone calls and requests for play dates. Our group met weekly for 2-3 hours and each of the 8 members went around in a circle and talked about the wins and challenges of the week. It was very intense and all of us were very close. Or so I thought. She and another member of the group decided to teach sewing classes and my child was not allowed to be in the class. They made the distinction that the only girls that were permitted were two years older than my daughter but every week the pack of girls including the older girls and their younger siblings would cross the schoolyard in front of my daughter and I in the car and she would say ‘There’s Ramona and Willa going home together, why can’t I be with them?’ It was just heartbreaking and it went on for weeks and weeks. When I made overtures oy connect or investigate what was wrong or why she hadn’t responded to my last request, I was met with coarse vagueness and denial but no accountability. Daily in the school yard as moms would gather to visit outside our children’s classrooms I would join two or three of them talking and be met by weird snide looks or dissing of my sincerely expressed comments. One of the members if the group was an early childhood psychologist and I went oy her in frustration. Two of the other members of the group had solved a disagreement in front of the rest of us through mediation with the therapist. I requested this with the passive aggressive bully and she refused to do mediation and made no effort to contact me to acknowledge my efforts or to personally problem solve the situation. I could not believe it. Here we had shared birthing our children, the death of my sister in law. Countless hours hashing out the worries and excitement of early motherhood, our children felt like siblings and I was being systematically excluded from all activities outside of the weekly meeting. There were more sewing glasses that I wanted to participate in and that I expressed interest in that I found out later were happening with out me. There were group trips to the local pool with the kids that I wasn’t invited to and then near the end, I discovered that all the girls that were within 2-3 years of each other age wise were swimming on a local swim team together and I hadn’t been informed. Was this just accidental? I saw more than half of these people daily on our school campus. We met weekly to tell our stuff and catch up and yet there was something slipping. I felt crazy. I would wake up at night obsessing over something I had said or a tone I thought might have accidentally slipped into a comment I had made. It was hideous and ultimately I recounted all of this in an email to the group and was met with angry responses denying any wrong behavior. I was also told that I should basically just get over it because we were a group. It was horribly painful and took place over the course of three years so my confidence is only just now returning. To this day none of them will talk about it. Since I left the group I have had multiple people tell me in private conversation how the PABully also tarted them with the same devastating disrespect and casual disregard but no one will blow the whistle because she has so strange power and people in the community take a weird pride in being connected to her because she is so creative. The twisted thing is that the people in this group are a therapist, a children’s book writer, a voices against violence facilitator, an alternative style family movement writer, and others. People that are held in high esteem but have a strange ego investment in their own fabulousness. Thanks for letting me tell this story. I needed to. Thank you so much for contributing to this awareness. It is frightening how these bullies have a hold on people and you are absolutely correct in your observation of people not blowing the whistle. If they are in the good graces of these seemingly charming PABullies then they have nothing to lose. They gain acceptance and benefit. These bullies treat people like garbage and dispose of us when we have outlived our purpose for them. I’m absolutely moved that you shared bc you are a perfect example. 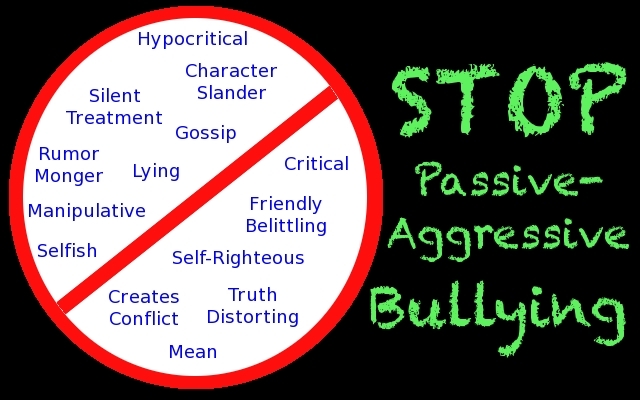 There are done people who feel like they are being bullied but really they are in some type of skewed perspective but you experience is the classic and brutal example of Passive Aggressive Bullying. I can only hope that you will recover quickly. Thank you again from the bottom of my heart for sharing your truth.